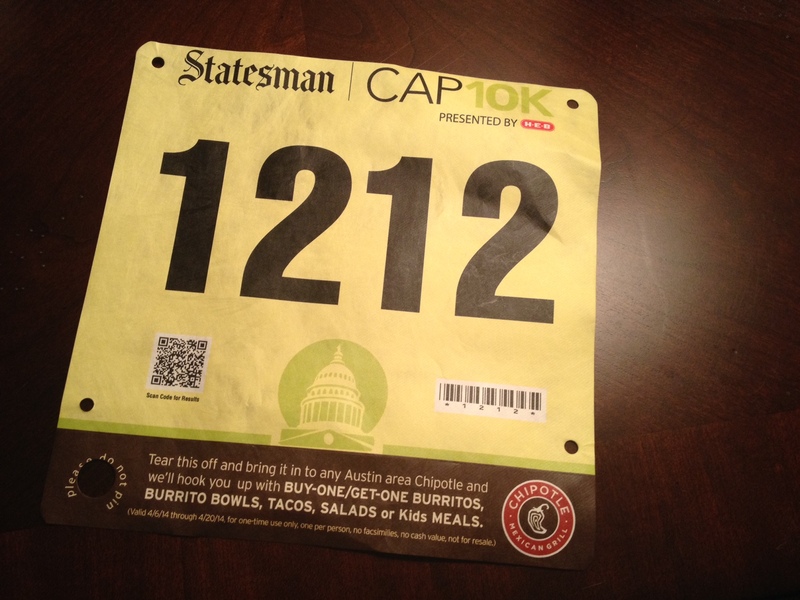 This is my race bib for the Cap 10K. It’s my first race bib. This bib is yellow. Most bibs are white. This bib is yellow because I was going to run 6.2 miles in less than 45 minutes, and I was to be a “seeded” runner. That meant that before the starting gun, I would’ve lined up at the front of the other 18,000 runners. I would’ve been been lined up with other “seeded” runners. And behind the “elite” runners. Like the Kenyan guys. I’m not running in my first 10K because two weeks ago I wiped out on a skateboard and injured my right foot so badly that I haven’t been able to put a running shoe on that foot since. I haven’t been able to run in two weeks and because of that, there’s a omnipresent void in my life. In July of last year, for whatever reason, I put on a pair of Nike Lunarfly’s that were hand-me-downs from a friend. I went to the track at the local middle school and I ran a mile. Since that didn’t kill me, I went out two days later and ran two miles through the neighborhood. Before I knew it I found myself waking up before my alarm and the sun, and I was running 5.25 miles every day. And I was getting faster. I broke a 9 minute per mile pace. Weeks later, I broke the 8:30 minute mile pace. I kept shaving off time. I kept pushing myself. I was alone with my thoughts, my music, my cadence, my stride, my pulse in my ear, my fulfillment. I was alone and I’d found a kind of spirituality. I broke the 8 minute mile. I’d fallen in love with running. Running was something I thought I’d never do again because I was too old and I’d deteriorate my knees. My knees are fine — they love me. My right hip is another story. I have to treat my right hip like a high maintenance drama queen with whom I’ve had a 20-year love/hate relationship. I was feeling really good and I was happy every day that I ran. I lost 25 pounds. I was eating right and fueling my body. I got my pace down to 7:15. On a really good day, I’d get damn close to 7 minutes. I had friends convince me to go on 10-mile runs. Never in my life would I have considered running 10 miles. Now I was waking up at 5 a.m. on weekend mornings to run long distances. For fun. I was fueling my spirit. On the eve of what would’ve been my first organized 10K I’ll have a pep talk with my right foot. We’ll run far and fast again soon.